Construction material, dashboards, health care products, stable bedding, biocomposite and much more. You can make more from hemp than you think. At HempFlax in Oude Pekela they are constantly developing new applications, also in collaboration with students from the Hanze University of Applied Sciences and the University of Groningen. 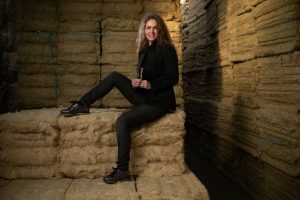 HempFlax aims high when it comes to the company’s mission: which global problems can we solve by using hemp products in daily life? It is the yardstick which the company measures its own activities against, and the question that provides inspiration. The company cultivates hemp in the Netherlands, Germany and Romania on fields of 2600 hectares. 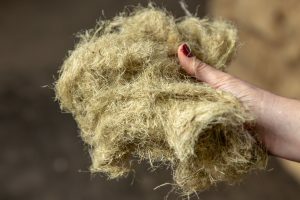 After harvesting, this hemp fibre is processed in factories in Romania and Oude Pekela. And the resulting products go all around the world. It is for good reason that considerable investments were made this year in a new testing ground with an actual injection mould machine on the factory site. Precisely to give this knowledge an extra boost. The laboratory was given the catchy name of the Hemp Design Factory and is embedded as an Innovation Workshop in the Hanze University of Applied Sciences. The researchers working there consequently form a colourful troupe. In the future, the Hemp Design Factory will be home to students from the Minerva Art Academy, business students, budding biologists, industrial designers and more. All of whom deal with hemp in the broadest sense of the word. Researching new possibilities with this natural product, but also examining news ways of making existing products economically feasible, to give hemp a role in a healthy lifestyle and the pursuit of sustainability. The Hemp Design Factory (HDF) has professionalised in a short space of time. Twenty-three students are now working on their research and making use of an appointed coach and various supervisors. HempFlax doesn’t organise this alone. The Factory is a typical example of a fruitful collaboration between governing bodies, knowledge institutions and the business community. It offers students from the Hanze University of Applied Sciences a wonderful place to gain experience, carry out research and bring knowledge into practice. And not only for HempFlax, because more companies are involved at the HDF.